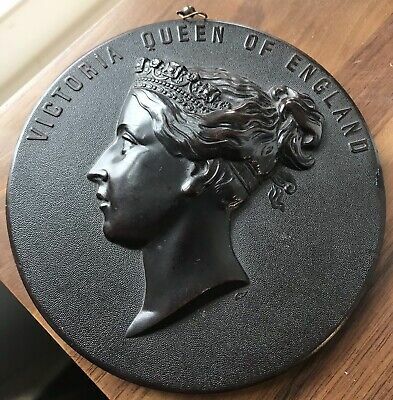 Seller: clearout123-1 (146) 100%, Location: Paignton, Ships to: GB & many other countries, Item: 192890448133 Antique Victoria Queen Of England Bois Durci Plaque. Nicely set in relief and inscribed to the back and titled to the front. 11.2cm diameter. Tiny blemish to the rim other wise in good condition. Popularity - 28 views, 9.3 views per day, 3 days on eBay. High amount of views. 0 sold, 1 available. 1 bid. 28 views, 9.3 views per day, 3 days on eBay. High amount of views. 0 sold, 1 available. 1 bid. Seller - 146+ items sold. 0% negative feedback. Great seller with very good positive feedback and over 50 ratings. 146+ items sold. 0% negative feedback. Great seller with very good positive feedback and over 50 ratings.